A person can suffer from both of these conditions at the same time. Here's how Lewy body dementia symptoms compare to those of Alzheimer's disease. Leading up to his suicide in 2014, popular actor Robin Williams suffered from such Lewy body dementia symptoms as anxiety, sleep disorders, and tremors along with memory problems. Williams is shown here in May 2004 at the Third Annual Tribeca Film Festival in New York. He's accompanied by his daughter, actress Zelda Williams. Lewy body dementia symptoms are often confused for signs of Alzheimer’s disease (AD). Both conditions are characterized by declines in thinking skills, and both can lead to mood changes and difficulty communicating. But while AD always results in significant memory loss, Lewy body dementia doesn’t always cause serious memory problems. Interestingly, Lewy body dementia symptoms tend to overlap more with Parkinson’s disease than Alzheimer’s. Lewy body dementia—also known as dementia with Lewy bodies and abbreviated as DLB—is the third-most-common cause of dementia, after AD and vascular dementia. Between 10 and 15 percent of dementia cases are due to DLB. But it is still not a well-understood condition, and Lewy body dementia symptoms are often chalked up to Alzheimer’s or Parkinson’s. Misdiagnosing Lewy body dementia for Parkinson’s disease is quite common. The late actor Robin Williams was initially diagnosed with Parkinson’s a few months before he committed suicide. It wasn’t until an autopsy after his death that doctors learned that his brain had been attacked by Lewy bodies—deposits of a protein called alpha-synuclein on nerve cells. Alpha-synuclein is found throughout the brain in healthy people, too, but researchers are still unclear as to its function. It’s when deposits, or Lewy bodies, form that alpha-synuclein causes problems. These deposits affect chemicals in the brain involved with thinking, mood, movement, and behavior. The symptoms Williams described to his wife before his death were frightening. In addition to memory problems that prevented him from memorizing lines in a movie script, he experienced extreme anxiety, sleep problems, and tremors. Tremors and muscle freezing are usually associated with Parkinson’s disease, which may explain why Williams and others with DLB are usually diagnosed with Parkinson’s only. Most people with Parkinson’s also have Lewy bodies. “If we see Lewy bodies in someone’s brain during an autopsy, that’s considered a ‘pathologic certainty’ of Parkinson’s disease,” says Liana Rosenthal, MD, assistant professor of neurology at the Johns Hopkins University School of Medicine. Many people with Lewy body dementia symptoms and Parkinson’s disease symptoms also have the abnormal beta amyloid plaques and tau tangles that are more commonly associated with Alzheimer’s. Beta amyloid and tau are other types of proteins found in the brain. 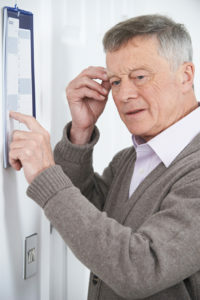 Memory loss tends to be more severe in early AD than in early DLB, while people with DLB sometimes develop the movement problems, such as muscle freezing and a shuffling walk, that are common to people with Parkinson’s. Hallucinations and difficulty identifying familiar people may be more common among early DLB patients than with early-AD patients. But all of these symptoms can eventually appear in people with DLB and AD. Research efforts are going on around the world to help neurologists better understand how Lewy body dementia symptoms can help distinguish DLB from Alzheimer’s. For example, the University of Michigan’s Alzheimer’s Disease Center established the Rinne Lewy Body Dementia Initiative in 2015 to learn more about the diagnosis and best treatment practices for people with DLB. One effort in that direction is an update in the diagnosing criteria for DLB. Neurologists, using their own research and feedback from DLB patients and their family members, reached a consensus about the criteria that should be considered in making a diagnosis. Among them are sleep studies and brain imaging. A condition called REM sleep behavior disorder, which may be present long before dementia symptoms appear, should be strongly considered as a possible sign of Lewy body dementia. Imaging that shows a reduction in the brain cells that produce dopamine is another possible indicator of DLB (as well as Parkinson’s). Repeated hallucinations are another common sign of DLB. Two other Lewy body dementia symptoms, fluctuating cognition and unpredictable changes in thinking, are also important to consider. If you notice any significant changes in your thinking, memory, mood, muscle control, and sleep, tell your doctor. While many conditions can trigger changes in cognition, it’s important to get an evaluation and any testing necessary to figure out what’s going on—and what you can do about it. alzheimer, amyloid plaques, anxiety, anxiety sleep problems, beta amyloid, brain, dementia, dementia symptoms, dopamine, extreme anxiety, forms of dementia, lewy body dementia, lewy body dementia symptoms, memory, memory loss, memory problems, mood, muscle, parkinson s disease, protein, rem sleep, sleep, sleep problems, sleep study, vascular dementia.